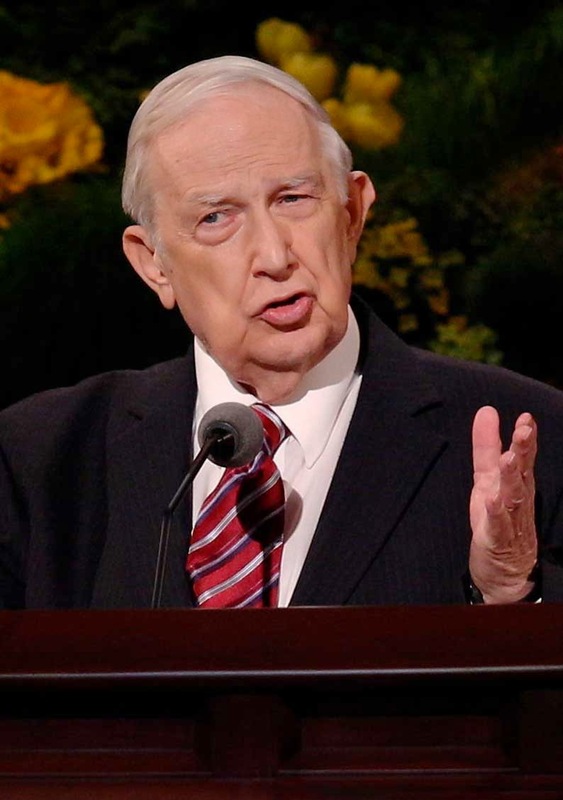 Elder Richard G. Scott (1928-2015) served as a Seventy from 1977-1988, when he was called to the Quorum of Twelve Apostles. He passed away in September 2015 at the age of 86. 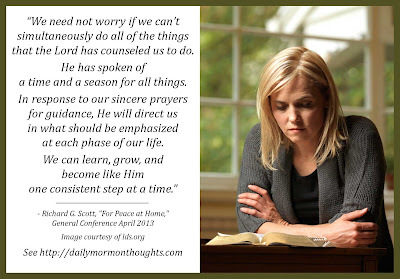 "We need not worry if we can’t simultaneously do all of the things that the Lord has counseled us to do. He has spoken of a time and a season for all things. In response to our sincere prayers for guidance, He will direct us in what should be emphasized at each phase of our life. We can learn, grow, and become like Him one consistent step at a time. "I bear testimony that living an obedient life, firmly rooted in the gospel of Jesus Christ, provides the greatest assurance for peace and refuge in our homes. There will still be plenty of challenges or heartaches, but even in the midst of turmoil, we can enjoy inner peace and profound happiness. I testify that the Atonement of Jesus Christ is the source of that abundant peace." The "one consistent step at a time" aspect is also very important. We don't transform all at once into Christlike perfection. But if we make steady progress, season by season, the desired results will be obtained. As we live obedient lives, "firmly rooted" on gospel principles, we find refuge from the world's challenges, and peace and happiness through the Atonement of Jesus Christ. Labels: Atonement, choices, priorities, Scott Richard G.